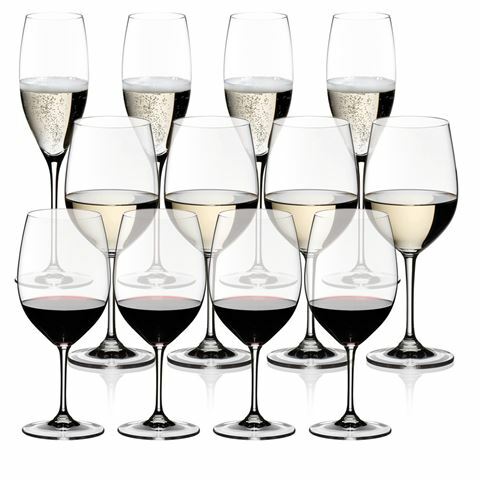 Includes three different wine glass designs: Cabernet Sauvignon/Merlot, Viognier/Chardonnay and Cuvee Prestige. Please take in to consideration the text “pay 8 get 12” on the box. Presented as a set in a Riedel box. 4 x 610ml (0416/0) Cabernet Sauvignon/Merlot Glasses – 22.5cm (h). 4 x 350ml (0416/05) Viognier/Chardonnay Glasses – 19.8cm (h). 4 x 230ml (0416/48) Cuvee Prestige Glasses – 21.8cm (h).